The New Zealand Flag is a symbol of the realm, government and people of New Zealand. Its royal blue background is reminiscent of the sea surrounding us. The stars of the Southern Cross emphasise this country’s location in the South Pacific Ocean. 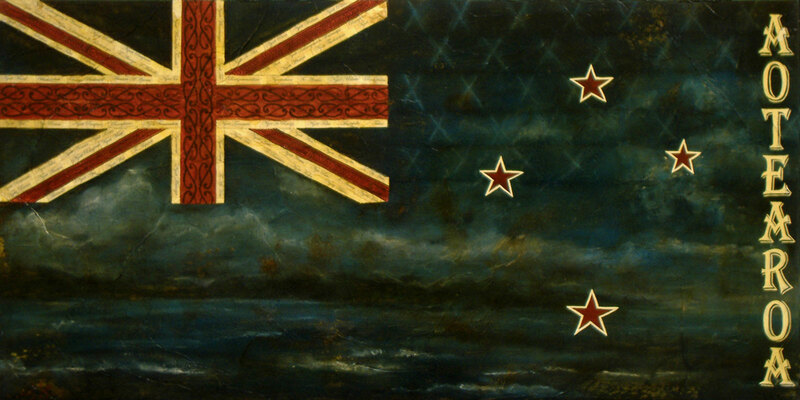 The Union Flag gives recognition to the fact that New Zealand was once a British colony and dominion. Kowhaiwhai: Patiki or Flounder, a symbol of hospitality. Script (white outline): A list of all the Maori tribes. Blue: North East coast, this is where it is believed that Kupe (Polynesian explorer) first sighted (Aotearoa) land with the long white cloud hovering above it. It was the great Polynesian navigator Kupe who discovered Aotearoa. Kupe lived in Hawaiiki, mythical ancestral homeland of the Maori.